Set sail - Explore New York State on the waterways. See things from a new perspective, excursion groups like CitySights NY and Circle Line Sightseeing offer hop-on-hop-off outings to popular NY spots. If you&apos;re looking for an in-depth view at New York, check out Wetlands Cruise on Stony Brook Harbor where marine scientists and naturalists guide you through NY landscape and wildlife. Board the Clearwater for an authentic 19th century river cruise. Known for its educational and environmental roots, this guided tour explores the history and ecology of the Hudson River while showing guests how to steer the tiller and hoist sails with the crew. Ride the Rip Van Winkle to grand estates, sleepy vineyards and picturesque villages on Kingston&apos;s Hudson River Cruises, or tour historic lighthouses aboard the Spirit of Hudson with Hudson Cruises. At the Lake George Steamboat Company, board the paddle wheeler Minne-Ha-Ha, the Mohican or Lake George&apos;s largest cruise ship, The Lac du Saint Sacrement, for historic cruises of the Queen of American Lakes. 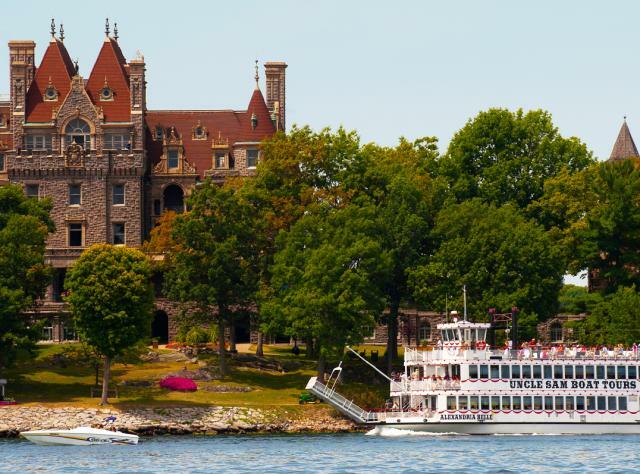 Clayton Island Tours&apos; professional tour guides will share the legends and lore of the Thousand Islands region with views of Great Lakes freighters, lighthouses and island mansions like Boldt Castle. Sail America&apos;s original waterway to the west with Erie Canal Cruises, or take a three-day canal excursion aboard the Emita II with Mid-Lakes Navigation Company. And of course, the natural beauty of Niagara Falls is best seen from Maid of the Mist, or the heart-pounding Whirlpool Jet Boat where you&apos;ll splash through the Niagara River right up to the falls.